Rich Baird, Superintendent, presented the September #NUPride award to teacher Lisa McKinley. 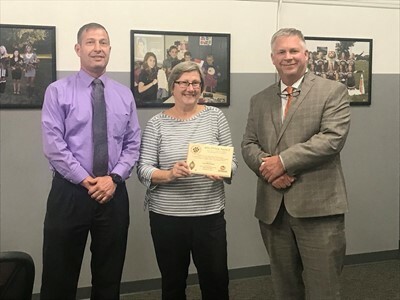 Mrs. McKinley has taught for 38 years and has taken on many roles here at North Union including, teacher, mentor, coach and summer tutor. Lisa teaches students how to read, write and do arithmatic but also teaches students how to become young adults. Mrs. McKinley always strives to make NUMS a great place to teach and learn. We appreciation and thank Lisa for all of her hard work and dedication to our students. If you have a community member or staff member you would like to nominate and celebrate please use the form below.